What’s it like to have Phil Kessel as a teammate? 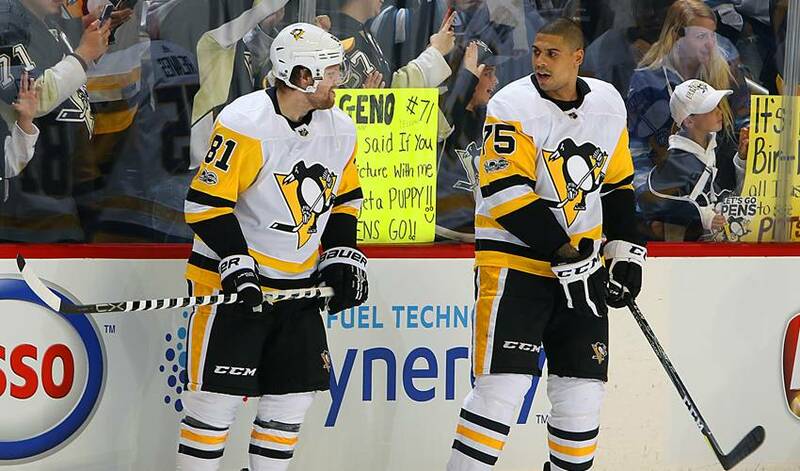 Ryan Reaves and Bryan Rust are happy to share their thoughts. There’s enough evidence to suggest one of hockey’s toughest players might not exactly be close friends with the Penguins No. 81. From wearing a T-shirt with Kessel’s face over Michael Jackson’s body on a nationally televised hockey broadcast, to gleefully getting the better of him in a game of basketball, to one of the best sports pranks ever caught on camera – hiding in a hotel room and jumping out wearing a scary mask – Reaves seemingly delights in tormenting his Pittsburgh teammate. Turns out, the imposing forward actually likes the player who bears the brunt of his good-natured ribbing. How does Reaves feel about the opportunity to show Kessel some love? Rust, who has won a pair of Stanley Cups with Kessel, also points out the 30-year-old’s sense of humour. Kessel’s on-ice contributions, however, are no laughing matter. Since the trade that brought him to Pittsburgh on July 1, 2015, the Madison, Wisconsin native has 163 points in 193 games. This season, Kessel has 13 goals and 34 points in 29 games. In last season’s Stanley Cup playoffs, Kessel led all scorers with five power-play tallies. In 25 games, he racked up 23 points. “He led the playoffs in power-play goals and he’s in the top 10 in points this year,” noted Reaves. “That tells you a lot about what kind of player he is. He’s just a very good player. He slows down the game very well. All the high praise doesn’t mean Reaves is bucking to net Kessel as his road roommate. Maybe they would get along better, offered Reaves, if Kessel would take his friendly advice. Kessel might be wise to heed Reaves’ words. After all, you never know what, or who, is around the corner. There was a time, Bryan Rust recalls, when his collegiate hockey career and a possible shot at playing on the game’s biggest stage could have fizzled out. He somehow found a way to make sure it didn’t.